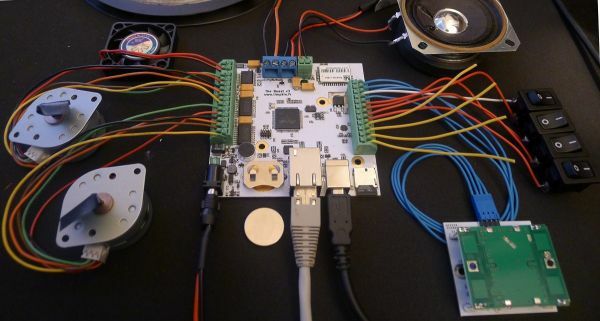 While HANDMADE.hackaday was a rather ephemeral experiment, we still come across some mighty fine examples of handmade projects that we think deserve to grace the pages of Hack a Day. As is the case with this beautifully repurposed guitar amp turned tool cabinet. After gutting the original amp, [Max] set to bending some 22ga steel plate into drawers. He enjoys using that particular gauge because its fairly easy to cut and bend, while still being rigid enough for most applications. Once content with the bending jobs, he attached ball bearing roller slides to the sides and installed the drawers. Making use of the original amp face for the top drawer he cleaned up all the edges and gave it some new paint — it’s a beautifully crafted example of what you can do with a bit of sweat and elbow grease! And for the audiophiles, don’t worry — the amp wasn’t functional before it was cannibalized for its casing. Despite the cries for updated hardware, the Raspberry Pi foundation has been playing it cool. They’re committed to getting the most out of their engineering investment, and the current board design for the Raspi doesn’t support more than 512Mb of memory, anyway. What you see above isn’t a Raspberry Pi, though. It’s the Carrier-one from SolidRun. All loaded out, it has a system-on-module with a quad core ARM Cortex-A9, 2GB of RAM, 1000 Mbps Ethernet, USB host ports, eSATA, and LVDS display connector, a real time clock, and everything else you get with a Raspberry Pi, header pins included. It’s all the awesomesauce of the newer ARM boards that will still work with all your Raspberry Pi hardware. If you’re thinking this is a product announcement, though, think again. The folks at SolidRun are merely using this Raspberry Pi form factor board as a prototyping and development platform for their CuBox-i device, In its lowest configuration, the CuBox-i1 is still no slouch and would be more than able to keep up with the most demanding Raspberry Pi applications. Still, though, a hugely powerful board with lots of I/O is something we’d all love, and if SolidRun gets enough complaints praise, it seems like they might be willing to release the Carrier-one as an actual product. Wow! What a trip. In just over one week we travelled nearly 2000 km and visited 13 hackerspaces in 10 different cities in Germany, Belgium and The Netherlands. However that was only the tip of the iceberg — there were dozens more hackerspaces in the area, and we wish we had the time to visit them all! The hospitality of the hackerspaces was amazing. Thank you so much to all the spaces we visited! If you missed some of tours, you can see the them all here. Did you enjoy these tours? Is there anything you’d like to see more of? The style of the tour? Other things to focus on? Let us know in the comments!